Today I'm sharing two comfy sweatshirt looks using McCall's pattern 7688, which is a new pattern they come out with this season. 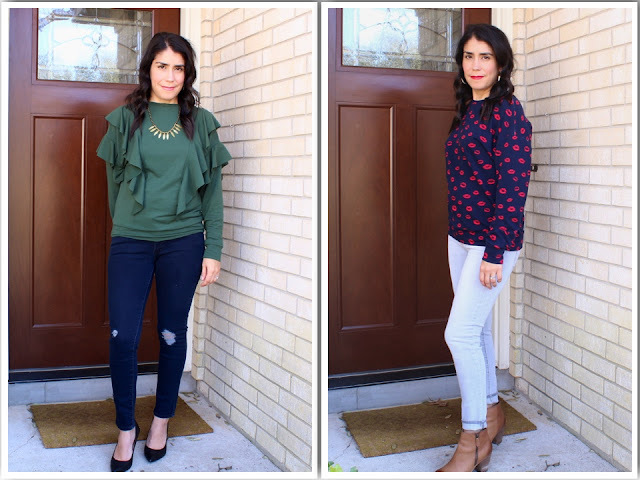 These were super easy to sew up and this winter here in Texas has been perfect to wear these two looks. I'll share with you the two different ways that I sewed these up. First, the fabric for both is French terry and were purchased on GirlCharlee.com. The fabric was very easy to work with, they have the perfect stretch and are so soft. These looks are Views A and B, I cut out size Small for both. For View A, I used my serger for all of the seam sewing. I was mostly happy with the results and it was very quick to sew up this way. However since I used white thread (I never change my serger thread) some of it peaks out at the seams. It's not horrible but would have been nice if it blended in. For View B, I used a stretch stitch using a matching thread for all seams and flounce. After sewing with the stretch stitch I serged the seam allowances together for the neck, wrists and waist bands. This way of sewing took a little more time to put together but I am happy with the results. Below are more of my thoughts. Difficulty: This was very easy to sewing together. 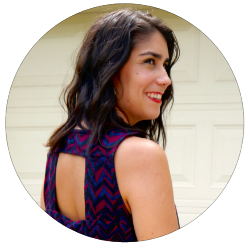 I recommend this pattern for all sewists who want an easy, everyday piece to add to their cold weather wardrobe. This is also a great pattern for beginners that want more experience sewing with knits and sewing neck/wrist/waist bands. Look like photo on packaging? : Yes it did. Pattern instructions: They were easy to follow. Of course I used my own ways of sewing all the seams, the instructions mainly was as a guide for assembly. If you are a beginner, be sure to take a look at my post about tips for sewing knits. 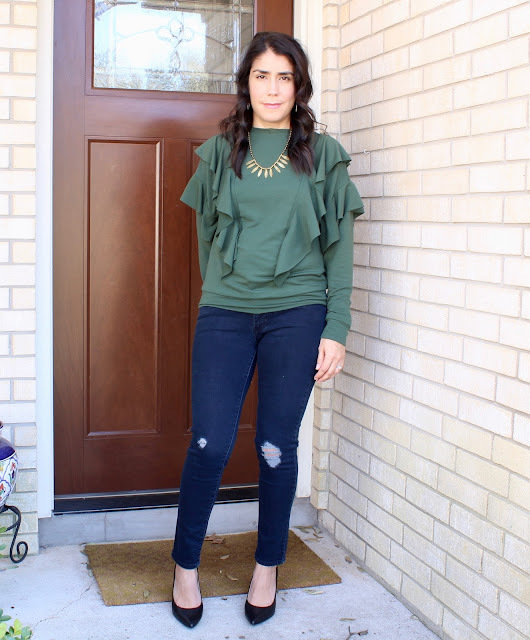 As for styling, I dressed up the olive green sweatshirt with dark denim and heels. This would be great for a night on the town. 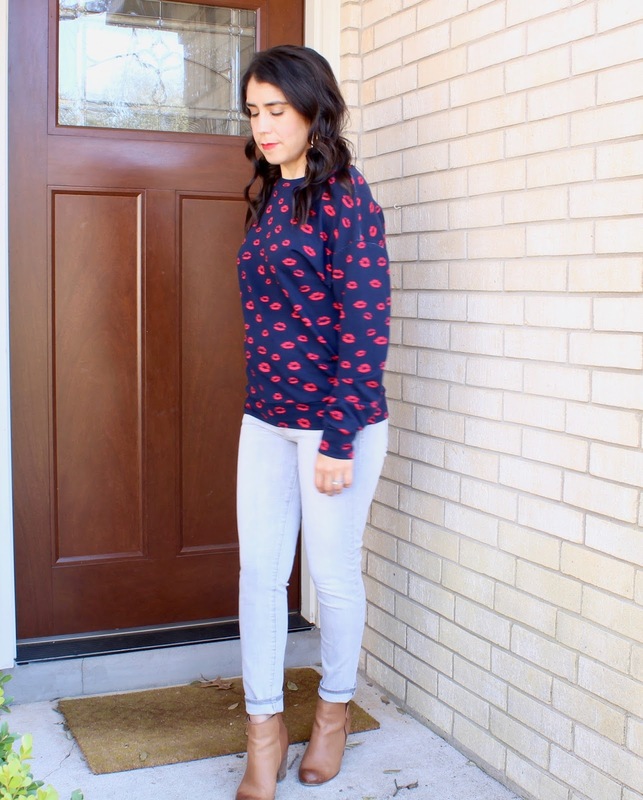 The navy sweatshirt is perfect for dressing up or down. 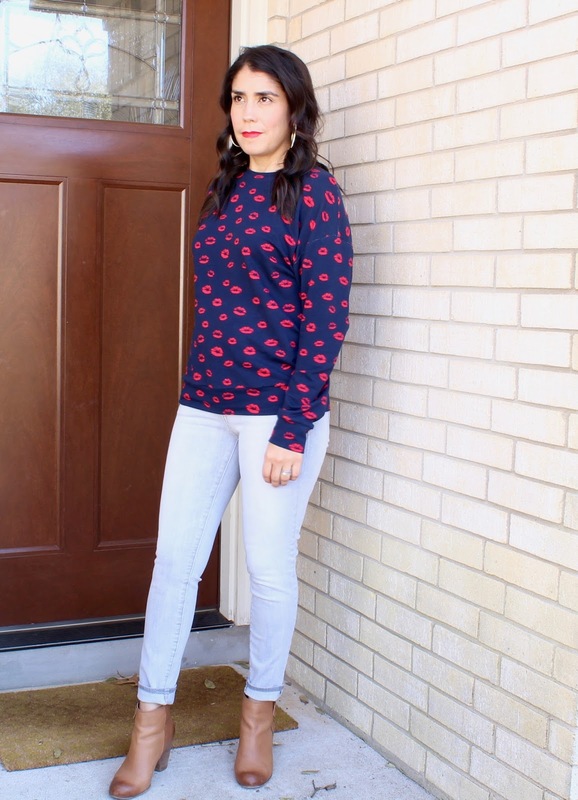 And of course the kisses pattern is just right to wear to Valentines. I paired this shirt with light gray jeans and tan booties. But this shirt could work with black jeans or a pencil denim skirt too.